In the past whenever I’ve announced that I intended to release new designs by a certain time something or other has always happened to delay that. This time I kept my mouth shut until recently and planned to have the next two designs ready to go by April. Deadline beaten! They’re ready to roll now. BrightSea Village followers, I apologise for teasing you with vague hints about the new house. Actually that’s not a worthwhile apology because I will do it to you again. Wait until you see what I’m doing next . . .. But anyway, I hope you’ll like BrightSea Village #10 The House of Haunts. I had so much fun with this one. There’s a cat riding a broomstick, a dapper vampire with his pet bats, a scarecrow unsuccessfully guarding the pumpkin patch, and loads more. This entry was posted in BrightSea Village, Miniature Carpets & Rugs on March 31, 2015 by Elli Jenks. 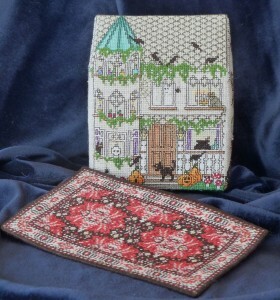 I discovered your work via Jan’s Thread Medley blog and just love your 3D houses. This one is definitely my favourite! I’m supposed to be doing the Stitch from Stash challenge and keeping my spending down but your projects have gone to the top of my Birthday list! Thank you, Joanne. I hope your birthday wishes come true.